That horrible ugly hill!! I can’t seem to keep any grass on it! If this sounds familiar we have the solution for you! 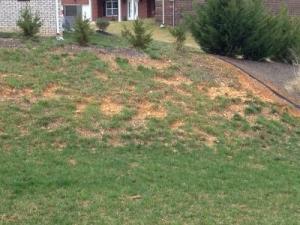 Hills, slopes and banks can be very challenging when it comes to growing grass. Many types of grass such as fescue, rye, Bermuda and St. Augustine do not have very long roots. This makes it hard for these grasses to hold on during heavy rains and down pours. Once the grass washes away it allows erosion to start. This allows your topsoil to wash away making gullies and making it more difficult to grow new grass. When trying to repair the erosion, planting grass seed on hills and slopes can be very frustrating. After sowing the seed, if you have a rain, the seeds may wash away or the birds eat and carry them away leaving little to take a roothold. What seeds do take are easily washed away even in light rain causing more soil erosion. Even watering becomes difficult as the top of the hill dries out and the bottom is too wet. This is not the case with Amazoy zoysia grass plugs. Amazoy zoysia grass is excellent on hills, slopes and banks. This grass is planted as plugs, which gives the roots more to hold on to from the beginning, allowing the grass to take a good hold. 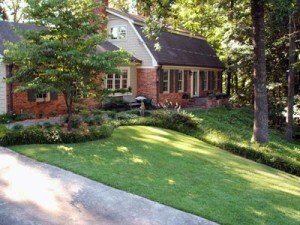 Amazoy zoysia grass roots can reach up to 2 feet in length once established. With roots like that you will never have to worry about erosion again. Instead you will be enjoying a thick full carpet of grass on your hills, slopes and banks. You also get an added bonus. Amazoy is also a much slower growing grass resulting in a lot less mowing, which is also great when it comes to hills and slopes. Especially going uphill!